That’s how I felt Saturday night as I fell asleep on the red eye departing from Salt Lake City. My wife and I just completed a week vacation with her parents and brother skiing in the mountains of Utah, and we capped it off with my first visit to the Sundance Film Festival. We scheduled the vacation with short notice, and it was only after setting the trip’s dates we realized its tail end would overlap with the start of Sundance. We didn’t have tickets to any films, but I knew I wanted to visit New Frontier, the social and creative venue that showcases media installations, multimedia performances, and transmedia experiences. First, we went to another venue to see if we could get tickets to a documentary, but it (like all the other films that day) was sold out and had a very long waitlist queue in which we would need to stand for over an hour before getting a number to hopefully be selected two hours later, when they assessed open seating and called off numbers. Needless to say, it didn’t sound like our idea of a fun day. 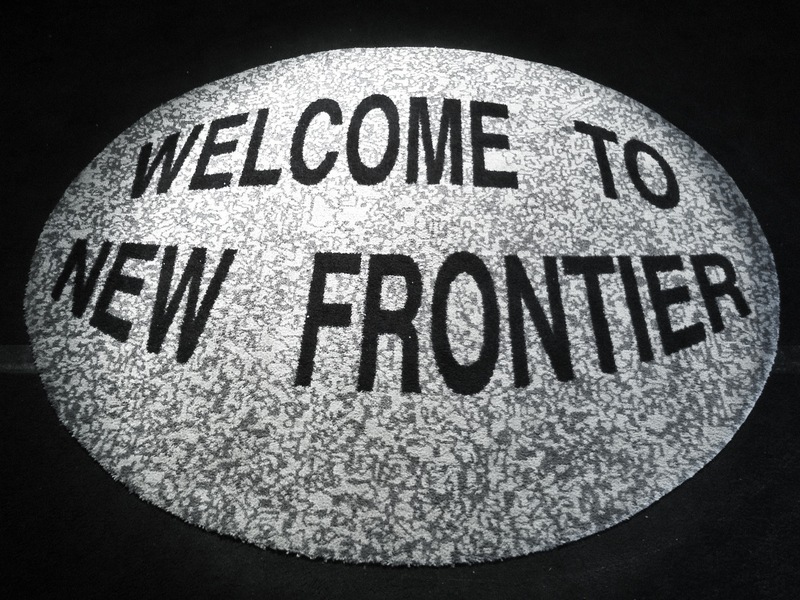 We headed over to the New Frontier venue. Sandwiched between one of the park-and-ride lots and The Blind Dog sushi bar is The Yard, a 100,000 square foot multipurpose space that houses the New Frontier venue. Divided into three parts, the main area features a gallery-style space featuring the New Frontier artists. The other two spaces offer a theater specially designed for the venue and a bar/lounge area for press interviews and parties. I spent most of my time in the gallery and saw two short films during our visit. We arrived at noon, which is when the venue’s doors open. Immediately, I asked for the box office because I knew Coral: Rekindling Venus screened at 1:00pm, and I hoped we could get on the waitlist. Being the first to arrive, we got on the waitlist with no problem. While we waited, the New Frontier volunteer staff helpfully explained the photographs of coral hanging nearby trigger an augmented reality app that takes you “inside” the photograph, animating it as if you are under the sea. You can download the iOS app here or Android here and use the pictures I took to try it out. Click the thumbnails for larger images. An hour later, we were lying down on mats and beanbags in a small planetarium, which reminded me of a yurt one might find at Burning Man. 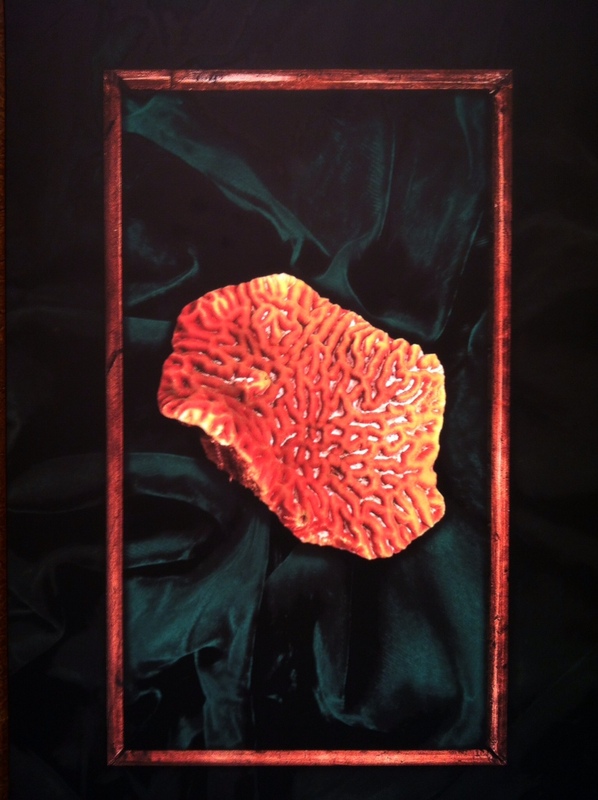 Inspired by the first collaboration among the international science community to witness the celestial transit of Venus in 1761, Lynette Wallworth’s Coral: Rekindling Venus is designed to nurture an emotional connection between a global audience and the planet’s endangered coral reefs. It has a trance inducing effect as one reclines, opening to ocean animals, including sea lions, deep sea bio-luminescent creatures, and of course, stunning time-lapse coral shots. Prior to the screening, Evans & Sutherland, the company that created the planetarium, offered a demonstration of the numerous projects using their technology. The demo was almost as interesting as the film, for it included examples of real time, interactive tools for teachers. My mother-in-law, a retired junior high school science teacher, looked like a kid in a candy store and marveled at how this technology will change how we teach science. Way cool. Next to the planetarium was a wall scrawled with graffiti and donning a poster of a large rock. 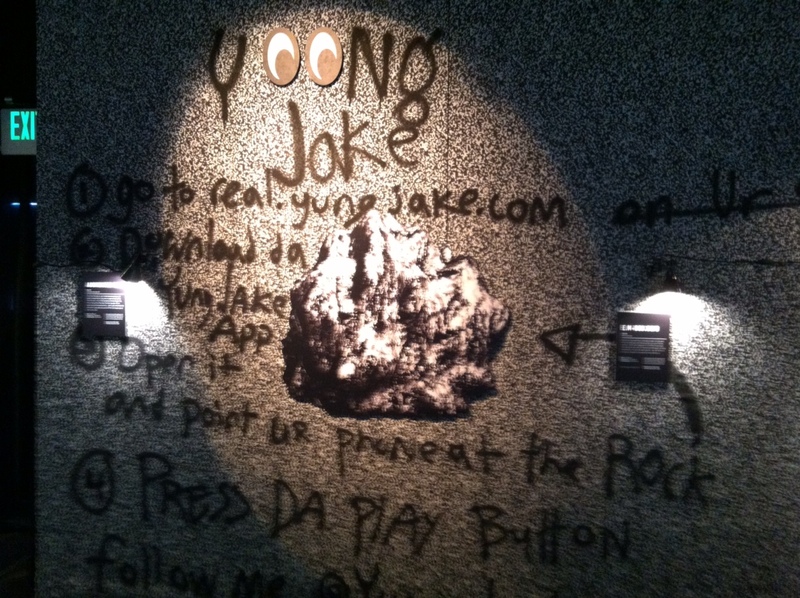 I immediately recognized the rock as the handy work of Yung Jake. Prior to our trip to Utah, I visited the Sundance New Frontier website to check out the artists. I discovered Yung Jake’s E.m-bed.de/d, a wild, truly innovative music video that takes over your browser. Seriously, click on the link above, hit play, watch the video, and then come back and read the rest of this. After I found Yung’s work, I followed him on Twitter and shared E.m-bed.de/d. Yung DMed me and offered a beta test of the app he’s premiering at Sundance. It’s a trippy, 3-D, interactive music video that plays on your phone or tablet called Augmented Real. You can download the iOS app here. (No word on Android.) Point your device at the rock image above and press play. I’m only sad we left town before Yung played his live performances. He performed a sold-out show last night. If you caught the gig, let me know how it was. He has one more show tomorrow, January 24. It looks like there are still a few tickets left. You can buy them here. According to L.A. Weekly, Yung Jake, may very well end up being the breakout star of Sundance. 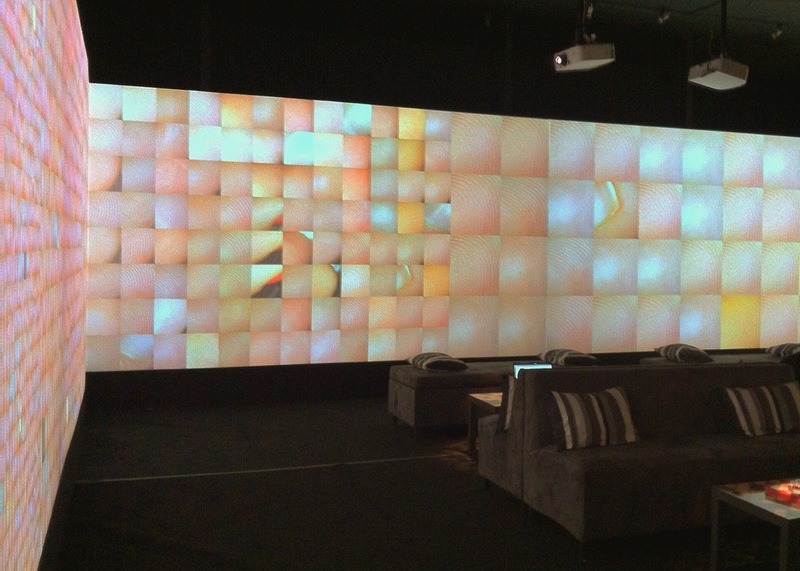 Pulse Index is an interactive art piece that does what I love most. It makes its audience into the art. Rafael Lozano-Hemmer’s installation records the heart rates and fingerprints of participants and displays them in a Fibonacci pattern. You place your finger into the custom-made sensor, and your fingerprint appears on the largest cell of the display, pulsating to your heartbeat. Your print then travels down the sequence to join those of all the others who have visited the room. The mosaic of pink prints cover the walls of the room, constantly shifting the energy of the space. It’s breathtaking. 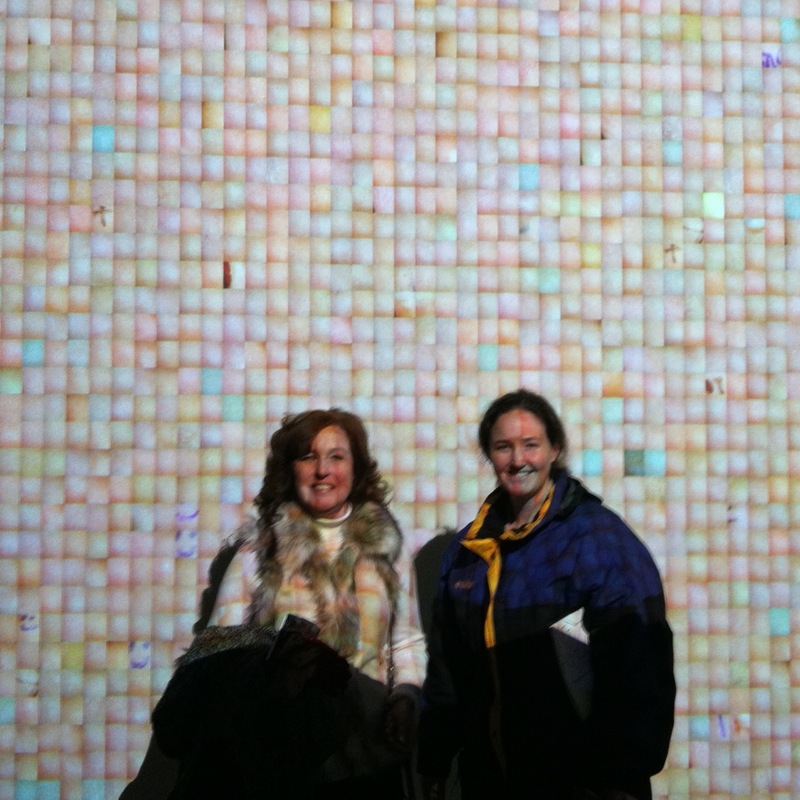 My wife and mother-in-law cheesing amongst the pixelated prints. My favorite piece at New Frontier was What is He Building in There? Inspired by the Tom Waits song of the same name, Ricardo Rivera and the Klip Collective transformed the front facade of the New Frontier venue into a 3-D, projection-mapped parable. Lately, I’m a sucker for 3-D projection-mapping, and this Kafkaesque, existential concoction of live action and animation blew me away. On the surface, the building looks like the outside of a factory, but throughout the film, walls dissolve away and windows slide open, showing the never ending toil of a solitary worker building…something. 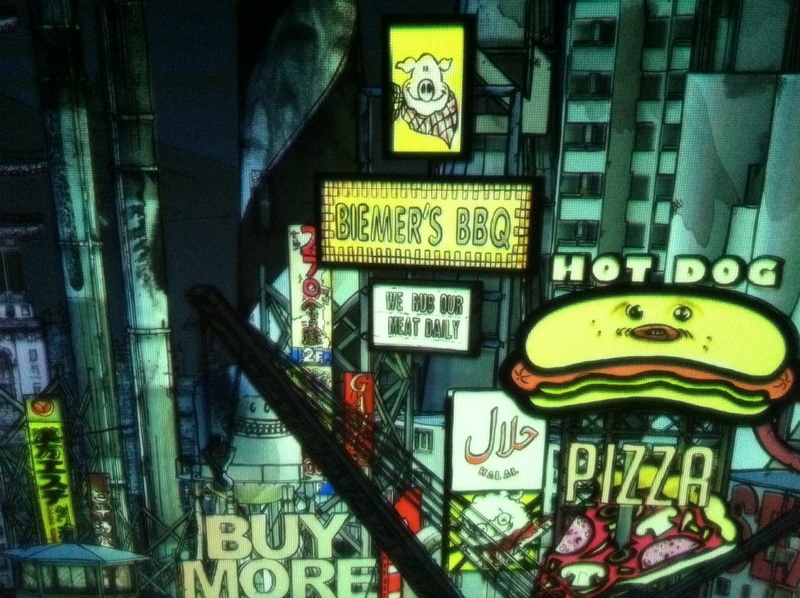 “What’s He Building In There?” Sundance 2013 New Frontier documentation from Klip Collective on Vimeo. One of the best parts of this was when a woman approached the entrance of the building and she waited for the projection to “open the door.” When it “opened” and she tried to walk through the door, she discovered the actual door still blocked her way. A true testament to the projection’s precision. I didn’t get to check everything out. I heard Eyjafjallalokull, a three-dimensional, audiovisual mapping, optical illusion installation inspired by the 2010 Icelandic volcanic eruption, was wonderful. We couldn’t get tickets to North of South, West of East which wraps the film around the entire room in a 20-seat theater with swivel chairs. And Cityscape 2095 placed spectators on the observatory deck of a skyscraper, where they take in an imaginary city as it glitters over the course of one day. It was super cool, but I couldn’t stand there all day to watch it change. We arrived at Sundance on a wing and a prayer, and as luck would have it, we enjoyed most of the New Frontier exhibition. 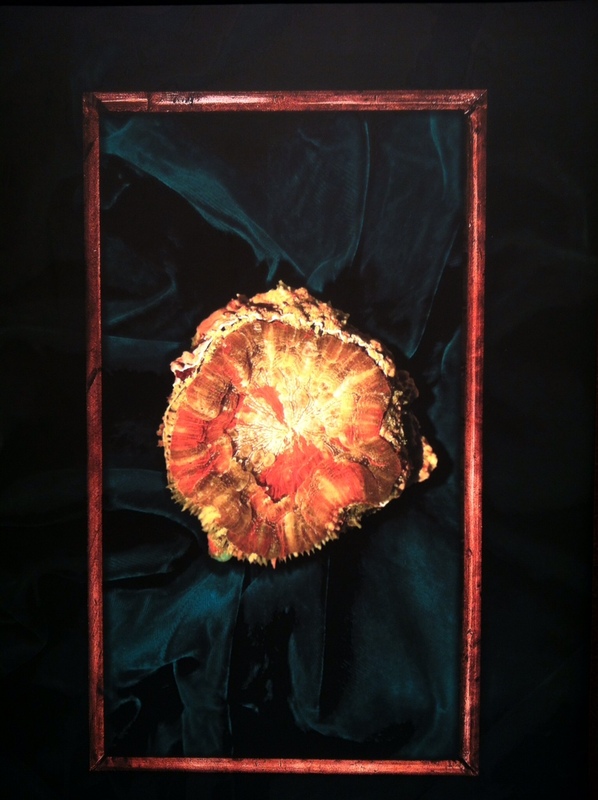 If you’re in Park City this week, I highly recommend checking these exhibitions out. It’s not a crowded as Main Street, the volunteers are more than happy to help you explore the interactive aspects of the art, and you might just have your mind blown. It was definitely a high point of my week in the mountains of Utah. The only thing I’d do differently next time? Plan ahead and schedule more than one day at the festival. So little time. So much to see! A NYC major newspaper needs to snag you as an arts reporter. I love the way you draw the reader into the scene, your objectivity in reporting, and your use of supporting research. Thanks. I’m writing for Culturadar now (http://www.cultureradar.com/blog/2013/01/08/The-Lost-Children-want-you.html), and I’m looking to branch out as the year goes on. Hope you’re well!